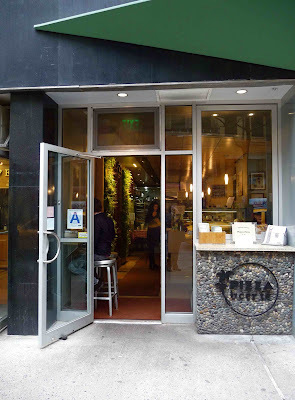 Pizza is everywhere in Midtown. 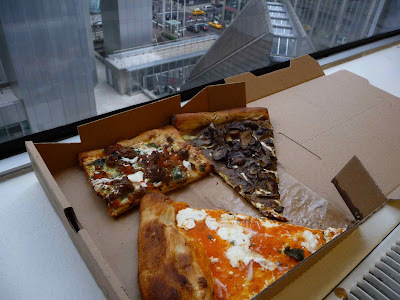 From Ray Bari and Sbarro cranking out chain style pies to an ever-growing coterie of 99-cent slice shops churning out pizza that tastes like you've overpaid, to a myriad of generic pie shops, we can now add, with much rejoicing, that Midtown has its own haute pizza. Courtesy of Cer Te, the high end caterers with a shmancy cafe, we can now partake in the joys of pizza that doesn't drip florescent orange grease down your arm while you cross the street eating. I'm a folder. People who don't fold their slices piss me off. I genuinely find it irritating. Just the other day, I was out with a girl who ate her crust first and I found myself suddenly unable to hear a single word she said. "What are you doing?" I thought. And those out there who whip out knives and forks... don't get me started. 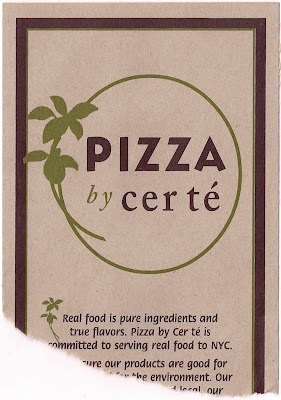 However, Cer Te's pizzas are not the typical kind you might find with a line of tourists or a stabbed mobster in front of. Cer Te almost requires that you eat it with a fork and I don't recommend the fold. And despite these shortcomings, I like 'em. The Italian Wedding is the square slice you see below and comes topped with meatballs, spinach, mozzarella and hot pepper. Fantastic, though small. You can taste each flavor all at the same time without any of them muting the others. I'm pretty sure this defies physics, but there it is. The Shrooms is a pie covered in a blanket of roast wild mushroom, thyme and bechamel. It was unlike any other mushroom slice I'd ever had in that it was basically like a cream of mushroom soup in pizza form. Or a very flat bread bowl. I liked it. The Farmers, while good, was the most disappointing of the four. 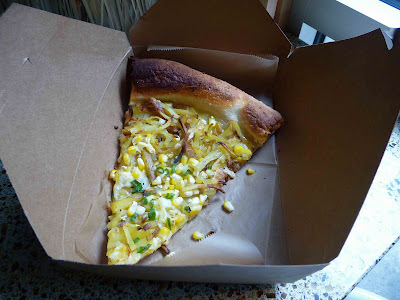 It was potato, cheddar cheese, scallions and corn. Like the result of a union between grandma's leftover side dish and an extra Boboli, it didn't do much for me. The most traditional slice on the menu is the Margherita Cer Te, and it was without a doubt great. Very sweet sauce, not overwhelmed in greasy cheese, with a nice char to the crust from the brick oven. Since Cer Te does far more than pizza at its other location, there is a wide range of desserts to choose from as well as a few salads and sandwiches, but ordering that at a pizza joint seems silly to me. They did look good though. Expect to shell out about $4 to 5 per slice with tax. Pies will be $25 to $30. Don't expect to sit there, as the place is microscopic and the few stools are occupied by people waiting for their orders to be finished. My biggest complaint is that cardboard box they give you your pizza in. Even if you stay there to eat it, they give you a huge crate to eat it from. 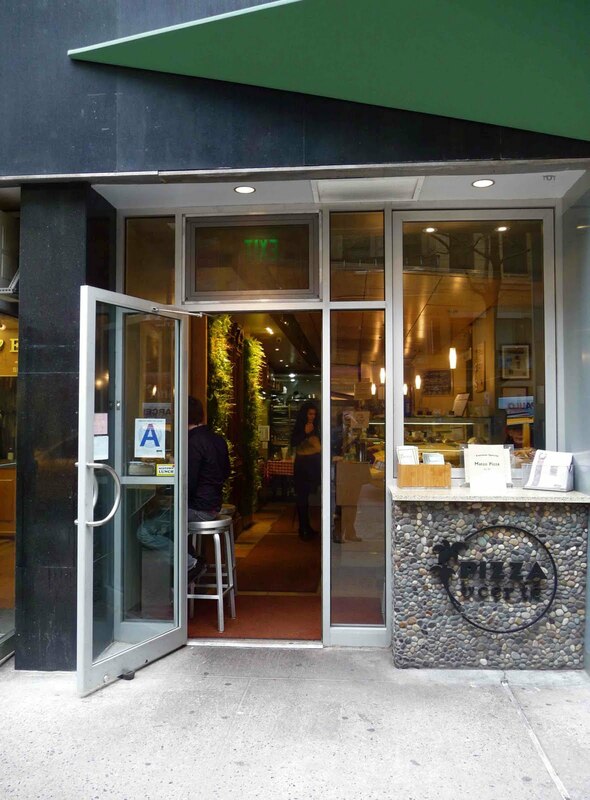 Totally wasteful behavior from a restaurant that touts its environmental-friendliness.